The 12 Days of Art is an annual social media gift from Hopewell Valley Arts Council, and a nod to the traditional 12 Days of Christmas. We hope this year’s art, by HV Arts Council members, sets off a creative spark in you for 2019! Day 2: Scott Fulmer, wooden eggs. 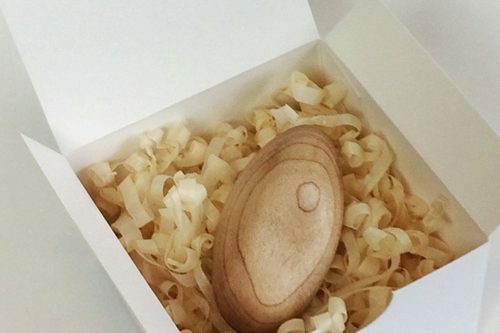 On the second day of art, my true love gave to me … a handcrafted egg by woodworker, Scott Fulmer. Some of Scott's more recent pieces are crafted using local ash wood collected from the devastation caused by the emerald ash borer beetle. What a beautiful way to commemorate the loss of our native tree species. Day 7: Gyuri Hollosy, Fugue in Hornets Mansion. 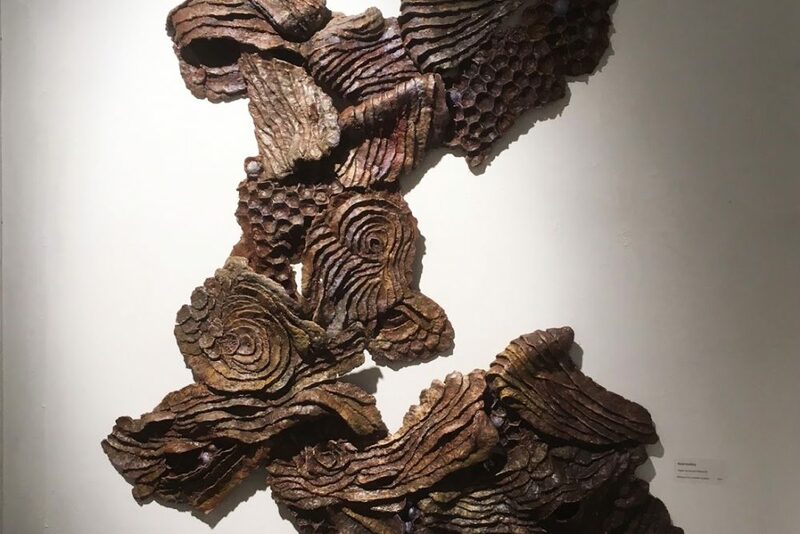 On the seventh day of art, my true love gave to me ... an imaginative wall sculpture by renowned artist, Gyuri Hollosy. Gyuri has been part of the HV Arts Council since its inception with the creation of the Stampede ox, “ArtToro,” currently placed in front of the HV Arts Council administrative offices at the Hopewell Valley YMCA. Gyuri will be one of the featured speakers at the next ArtConnect Forum on Thursday, March 21 to talk about his recent commissions in China and his unique resin sculpting medium. Day 3: Marissa Blossom, Winter Sketch. 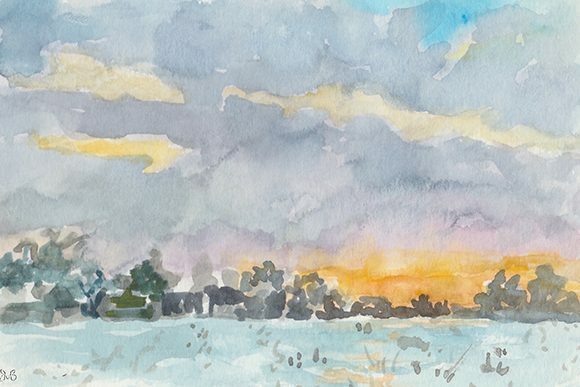 On the third day of art, my true love gave to me … a winter sketch in watercolor by Marissa Blossom. Two beautiful oil pastels by Marissa are currently on display through March 2019 at the Joy in the Everyday, HV Arts Council members show at Capital Health. 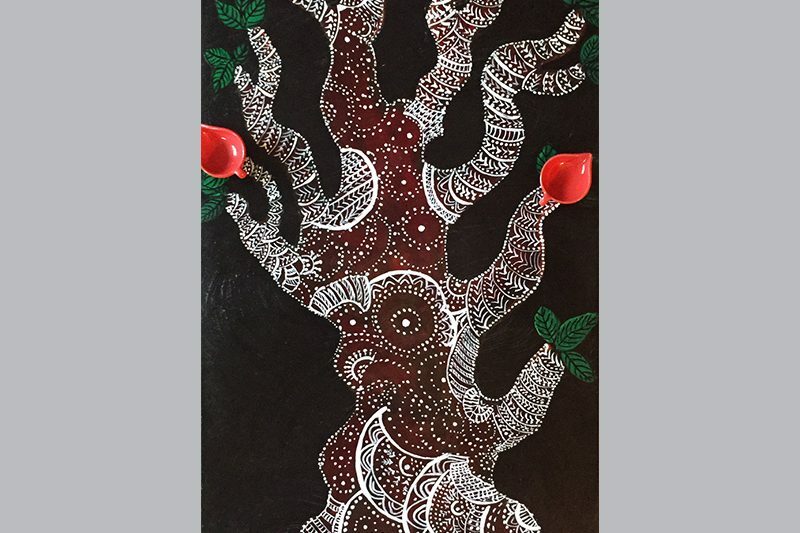 Day 1: Spriha Gupta, Tree of Life (mixed media and acrylic). On the first day of art, my true love gave to me … a tree of a different color. Two of Spriha’s colorful mixed media pieces are currently on display through March 2019 at the “Joy in the Everyday” HV Arts Council Members Show at the Investor’s Bank Gallery on the 2nd floor at Capital Health in Hopewell. 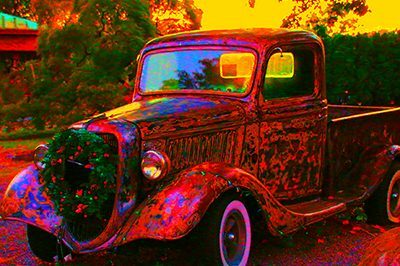 Day 5: Jennifer Driscoll, Christmas Truck. On the fifth day of art, my true love gave to me … a fun holiday image by local photographer, Jennifer Driscoll. Wouldn’t this be a fun way to deliver presents when Santa’s sleigh is in the shop? 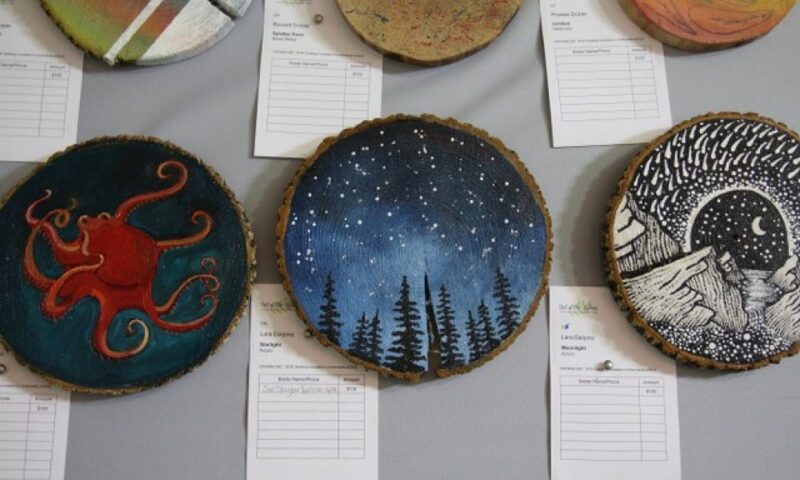 Jennifer was one of the featured artist at the Pennington Farmers Market at Rosedale Mills this summer. She also has two joyful holiday photographs on display in the current member’s show at Capital Health. Day 12: Barbara DiLorenzo, Snow Angel Contest. 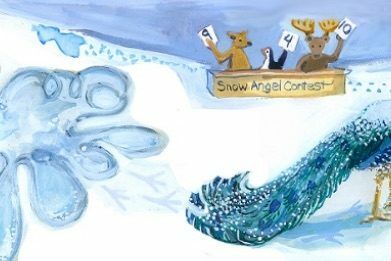 On the 12th day of art, my true love gave to me … a peacock with winning snow angel plumage by Barbara DiLorenzo. Barbara is an accomplished illustrator, cartoonist and amazing pumpkin carver. Barbara is currently working on a mural in the teen center at the Hopewell YMCA, home of the administrative offices of the HV Arts Council. Day 10: Jane Zamost, necklace. On the 10th day of art, my true love gave to me … a dazzling necklace fit for a queen by jeweler and painter, Jane Zamost. 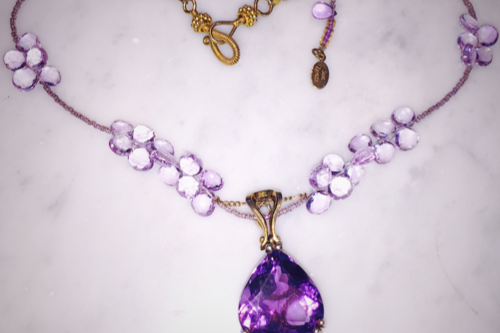 Jane reimagines vintage jewelry to create dreamy one-of-a-kind art pieces. Jane was part of the HV Stampede, creating the mosaic ox, “Splendor in the Glass.” Jane leads and inspires the Art & Healing Committee at Capital Health, collaborating with the HV Arts Council on the many art exhibits displayed at Capital Health. Day 4: Kristen Birdsey, Crisp. 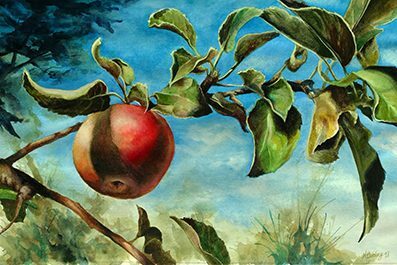 On the fourth day of art, my true love gave to me … a ripe juicy apple “Crisp” painted by Kristen Birdsey. Kristen has been involved with the HV Council since its inception, creating the popular armored Stampede ox, “Iron Oxide” and two watercolors currently on display in our member’s show at Capital Health. You can also see her smiling face behind the framing counter at Jerry’s Artarama in Princeton. Day 6: Janneke Vanderree, winter pillow. On the sixth day of art, my true love gave to me … a handmade pillow perfect for a long winter’s nap. This needlework is by Janneke Vanderree, an expert seamstress and quilter. Some of her imaginative pieces are available at Chance on Main in Pennington. 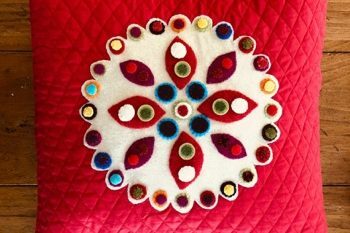 Janneke has served as one of the HV Arts Council judges for needlework at the Mercer County 4H Fair and has two pieces on display in the member’s show at Capital Health. Day 8: Dawn Berman dancing. 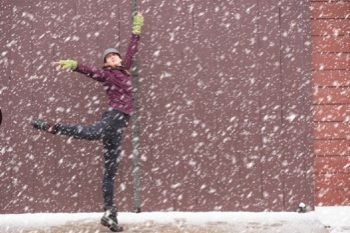 On the 8th day of art, my true love gave to me … a day off from the hectic holidays to do whatever I want to do, and I want to dance! This image features Dawn Berman, owner and artistic director of The Pennington Studio. Dawn is on the Board of Trustees of the HV Arts Council and has performed herself and with her students at many HV Arts Council events. Day 9: Benoit Cortet, Frost. 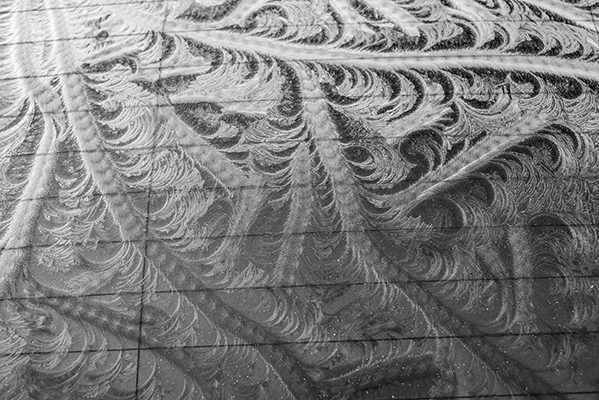 On the 9th day of art, my true love gave to me … a gorgeous photograph of feathery frost iby Benoit Cortet. You can see more of Benoit's photographs capturing the moment as they grace the cover of the monthly Hopewell Valley Neighbors publication. Day 11: George Olexa, Ski Runs. 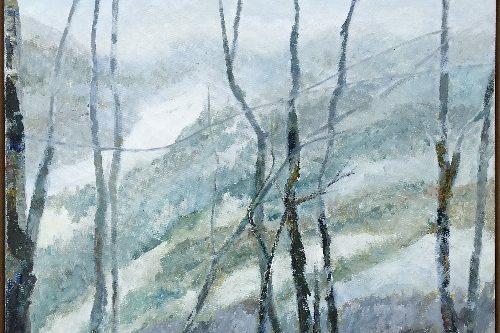 On the 11th day of art, my true love gave to me … a relaxing trip to the mountains in a painting called “Ski Runs” by multi-talented artist, George Olexa. George creates art in every medium imaginable. He was part of the HV Stampede, creating “Babe the Blue Star Ox” which can still be seen grazing at the Hopewell Crossing Shopping Center. George, along with several other artists, support the HV Arts Council by volunteering his time to hang the various art shows at the Investors Bank Gallery in Capital Health.